Comment: Ships from USA: May take 10 to 15 business days for delivery. Very Good Condition- May show some limited signs of wear and may have a black line or red dot on edge of pages. Pages and dust cover are intact and not marred by notes or highlighting. Tracking is not available for orders shipped outside of the United States. Take-no-prisoners trivia-offs. Pill-fueled Twilight Zone marathons. Fan interventions. Here is the ultimate word on the fugly side of fandom, collecting every Eltingville story from the Dork, House of Fun, and The Eltingville Club #1-2, comics three of which won the Eisner Award for Best Short Story. Also features the Northwest Comix Collective alt-comics smackdown and an afterword about the 2002 Adult Swim animated pilot. Definitive, complete and unashamed, this is fandom at it's fan-dumbest, in the mighty Eltingville manner! Start reading The Eltingville Club on your Kindle in under a minute. Evan Dorkin (born April 20, 1965) is an American comics artist and writer. His most well-known works are the comic books Milk and Cheese and Dork. His comics often poke fun at fandom, even while making it clear that Dorkin is a fan himself. As well as his comics work, Dorkin has also written for animation, including (with his wife Sarah Dyer, also a comics writer/artist, married) Space Ghost: Coast to Coast. He also wrote and produced Bring me the Head of Boba Fett, an animated television pilot for Adult Swim called Welcome to Eltingville, based on his own characters. Dorkin and Dyer also wrote some episodes of the Superman animated series, particularly the episode "Live Wire," which introduced a new character of the same name. Additionally, the pair contributed to the script of the 2006 English-language version of the anime Shin Chan. After an initial six-episode order proved successful, more episodes were ordered, but Dorkin and Dyer are no longer working on the series. They had also been developing a pilot for a series entitled "Tyrone's Inferno" for Adult Swim for the last few years, but according to Dorkin's LiveJournal the project is dead. Dorkin has been the recipient of several Eisner Awards, including 2002's Best Writer/Artist: Humor. This book is not a parody. It is an indictment. I have met the Eltingville club; at my worst moments I have been the Eltingville club. This book is an insider's look at everything wrong with fandom today, and it needs to be read because it doesn't glorify or excuse the club and their awful, sociopathic lifestyle: it just shows it as the ugly mess it is. 5.0 out of 5 starsHilarious, fun, sad and troubling. The dark side of fandom. 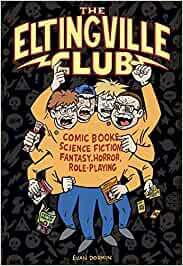 The Eltingville Club... four teenage outcast nerds with a deep obsession with fandom before it became mainstream. From the off-the-cuff esoteric references, to their ridiculous air of erudition (to legitimize the fact they are grown men playing with children's toys and reading comics) and the way all four of them will defend canon as fervently as a samurai defends his master, it is a scathing indictment of fandom in general. Between the laughs, nostalgia and the silly drama, there's a profound sadness here. Especially in the final issue. These boys are essentially throwing their lives away being ultra-consumers of the geek culture. Something that should be an accent in their life is in fact their whole lives. And as the boys creep towards middle age, we see they aren't changing. They're going to be the same man-children their whole lives. With one exception, and even his redemption isn't a sure thing. But it is hilarious, inventive, entertaining and very well drawn. Evan Dorkin explores different settings and conflicts with these four obnoxious fandom crusaders, and every time it feels fresh and funny. The hardcover is well constructed, the pages crisp, the printing top-notch. Very, VERY happy with this one. "The Eltingville Club" is not a comic book. Instead it is a grim,lusterless, pizza stained, comedic mirror starring at ugly side of fandom and revealing the pasty, malnourished, rude, belligerent, socially inept, unabashedly grizzly basement dwellers that lie within. Comicbook artist Evan Dorkin pulls no punches in his black and white inked critique of the people that turn a fun, casual hobby into a godawful, gate keeping, life swallowing nightmare. Every overzealous act of fandom depicted by Eltingville Club members is not exaggerated as Dorkin makes it out to be, and the crazy thing is that the comic stills hits the nail pretty hard on the head in 2016. Evan Dorkin truly has a mind from future, as almost every act from the book mirrors acts committed by today's "Super Fans"; from insane hour long binges of television shows, rage fueled rants on social media sites regarding comics and television, and awful gate keeping that dictates who can and can't been in the fandom. The Eltingville Club is truly both a love letter and warning regarding fans and all of their craziness. 5.0 out of 5 starsEvan Dorkin is Amazing! Outstanding work as always. All the great early stuff is still awesome. I really enjoyed the final chapter of the club even if I am embarrassed that it took me two years after publication to finally read it. I still consider myself very lucky to have gotten a signed Milk & Cheese piece of art from Evan himself at one of his last SDCC appearances. If you like irreverent humor then you will love this book, it really spears the annoying side of geek culture right in the balls. 5.0 out of 5 starsthis is what we're like. Yup, this is what we're like.